Objectives: Transplant immunosuppression increases the risk of cutaneous squamous cell carcinoma by 65- to 200-fold. Our objective was to investigate the impact of the type of organ transplanted on the risk and presentation of cutaneous squamous cell carcinoma. Materials and Methods: The retrospective database of the Duke University Health System was queried to identify patients who underwent an organ transplant from 1996 to 2016. Data regarding transplant outcomes, cutaneous squamous cell carcinoma, immunosuppressive regimens, and survival were recorded. We used chi-square tests, analysis of variance, and unpaired t tests to compare the incidence and presentation of cutaneous squamous cell carcinoma among organ types. Results: Of 3652 renal, hepatic, and cardiothoracic transplant patients identified, 142 patients developed at least 1 cutaneous squamous cell carcinoma. The incidence of cutaneous squamous cell carcinoma varied by type of organ transplanted, with 46 of 1684 (2.7%) renal transplant patients developing cutaneous squamous cell carcinoma, 33 of 804 (4.1%) hepatic transplant patients, and 63 of 1164 (5.4%) cardiothoracic transplant patients over the median follow-up time of 6.5 years. Incidence in the renal transplant versus the cardiothoracic transplant group was significantly different (P < .001). The time to presentation of cutaneous squamous cell carcinoma varied significantly by group, with the renal cohort presenting at 3.8 years compared with at 2.4 years in the cardiothoracic group and 2.1 years in the hepatic group (P < .001). Conclusions: The type of organ transplanted confers a unique risk and presentation of cutaneous squamous cell carcinoma. Since 1988, over 650 000 renal, hepatic, and cardio-thoracic (heart and/or lung) transplants have been performed in the United States.1 From 2012 to 2016, the United Network for Organ Sharing reported a 20% increase in organ transplant procedures, suggesting a trend of increasing frequency in the years to come. The immunosuppression vital to maintaining the transplanted graft is associated with an increased risk of cutaneous squamous cell carcinoma (cSCC) by 65- to 200-fold.2-5 The cSCC that develops in the transplant population has greater incidence of morbidity and mortality versus that shown in the nontransplant population.6 With few effective systemic or preventative therapies, local excision, such as Mohs surgery, and destruction, via electrodissection and curettage, are the mainstays of treatment. Few studies have investigated the impact of type of organ transplanted on the risk of cSCC.23-25 So far, none have directly compared risks shown among cardiothoracic, renal, and hepatic transplant recipients at a single institution. Furthermore, all previous studies on this topic have included fewer patients, by at least 1000 participants, than our present investigation. In this study, our aim was to investigate the impact of type of organ transplanted on incidence of cSCC. The Duke Enterprise Data Unified Content Explorer (DEDUCE) was used to identify patients who underwent a renal, hepatic, or cardiothoracic transplant from January 1, 1996 to December 31, 2016 at the Duke University Medical Center. This time period was chosen to allow for optimal data extraction via DEDUCE. The institutional review board at the Duke University Health System approved this project prior to data retrieval. Data abstraction included patient demographics, transplant dates, transplant outcomes, history of actinic keratosis and cSCC, outcome of cSCC, medication regimen, survival, death, cause of death, and last follow-up date. Due to the overwhelming likelihood of a second cSCC, patients with a history of cSCC before transplant were excluded from the study. We used chi-square tests and unpaired t tests to compare the incidence of cSCC between organ types. An ANOVA test was used to compare the time to presentation of cSCC between organ transplant cohorts. P ≤ .05 was considered significant. From 1996 to 2016, 3652 patients (1264 females and 2388 males) underwent a renal, hepatic, or cardio-thoracic transplant. Our results showed a total of 1684 renal transplants, 804 hepatic transplants, and 1164 cardiothoracic transplants. Of total patients, 142 patients developed at least 1 cSCC over the median follow-up of 6.5 years. The median age at transplant was 61.9 years (range, 33.9-79.0 y). Of patients who developed at least 1 cSCC, 22 were female and 120 were male (Table 1), with 140 patients of white ethnicity. The median time to cSCC was 2.5 years (range, 0.4-11.5 y) after transplant. 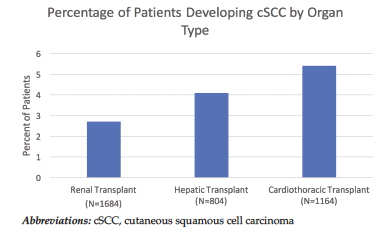 The incidence of cSCC varied by type of organ transplanted. In the renal transplant group, 46 of 1684 patients (2.7%) developed at least 1 cSCC compared with 33 of 804 hepatic transplant patients (4.1%) and 63 of 1164 cardiothoracic transplant recipients (5.4%) (Figure 1). We observed no differences in distribution of males versus females between organ subtypes (P = .08). However, the cardiothoracic group did have an older median age at transplant (65.0 y) than the hepatic group (59.6 y) and the renal group (55.2 y) (P < .01). The incidence of cSCC was significantly different between the renal transplant and cardiothoracic groups (P < .001). When we looked at type of immunosuppression, we found no statistically significant differences with regard to cyclosporine (P = .13), tacrolimus (P = .95), or mycophenolate mofetil (P = .51) treatment between the groups (Table 2). However, cardio-thoracic transplant recipients with cSCC did have significantly increased exposure to voriconazole and azathioprine (P < .01 and P < .01). Voriconazole was used in 38% (n = 24) of the cardiothoracic cSCC group compared with 6% (n = 2) in the hepatic group and 7% (n = 3) in the renal group. Similarly, azathioprine was used in 37%(n = 23) of patients in the cardiothoracic cSCC group compared with 6% (n = 2) in the hepatic group and 20% (n = 9) in the renal group. Incidence of azathioprine use did not vary between the cardiothoracic group and renal group (P = .055). A pretransplant history of actinic keratosis was significantly more common in the renal transplant group (9 patients [20%]) than in the cardiothoracic group (3 patients [5%]; P = .015). In the hepatic group, 3 patients (9%) had pretransplant history of actinic keratosis, which was significantly greater than that shown in the renal and cardiothoracic groups (P = .18 and P = .33, respectively). Metastatic cSCC was the cause of death in 2 renal transplant patients (0.1%), 3 liver transplant patients (0.4%), and 3 cardiothoracic transplant patients (0.3%). This finding was not significantly different between the 3 groups (P = .614). 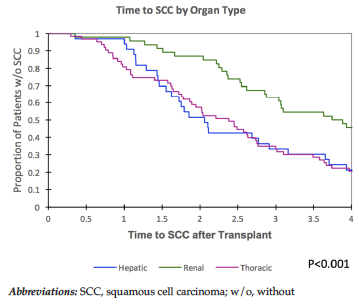 The overall time to presentation of cSCC after transplant was 2.62 years (range, 0.3-8.5 y). The time to presentation varied significantly between organ transplant group (P < .001) (Figure 2). The median time to cSCC presentation in the renal transplant cohort was 3.8 years which was significantly different from the 2.4 years in the cardiothoracic transplant cohort and 2.1 years in the hepatic transplant cohort. There was no significant difference in time to cSCC presentation when comparing the hepatic cohort to the cardiothoracic transplant cohort to each other. Cardiothoracic transplant recipients had a higher incidence of cSCC compared with renal transplant recipients. Although not significant, the incidence of cSCC was higher in hepatic transplant recipients than in renal transplant recipients. These findings advocate for consideration of the type of organ transplanted and not simply a history of transplant when risk stratifying patients for regular derma-tologic surveillance. Specifically, cardiothoracic, then hepatic, and then renal transplant recipients should be surveilled accordingly. This study directly compared the incidence of cSCC between the 3 largest categories of organ transplant (liver, kidney, and heart-lung). Several findings in our study add depth to discussions on risk of cSCC by organ type. The cardiothoracic group was exposed to more carcinogenic immunosup-pression, specifically azathioprine, and to the antifungal voriconazole than the other groups. The cardiothoracic group also had transplant procedures at a later age than the other groups. These findings alone independently increase the risk of cSCC. However, the renal group had a higher percentage of patients with a history of actinic keratoses, which are known to predispose to cSCC later in life. In previously reported lung transplant recipients, voriconazole resulted in a cSCC hazard ratio of 2.39.26 However, actinic keratoses, which can recur in up to 53% of patients, may transform into cSCC in anywhere from 0.025% to 20% of patients.27,28 It is also worth noting that a large percentage of the overall cohort was composed of males, which fits with the predisposition for cSCC in that group. Age over 50 years at transplant, another risk factor for cSCC, was common in every organ transplant group. However, when taken together, the cardiothoracic group was at higher risk for cSCC due to medication exposure, but the renal group was also at an increased risk due to their personal history of actinic keratoses. The overlapping risk factors between organ transplant groups underscore the challenges in predicting which patients will develop cSCC. We observed significantly different presentations of cSCC after transplant among the transplant groups. Despite having a lower risk of cSCC, the hepatic group had the earliest time to presentation of cSCC after transplant. Cardiothoracic transplant patients, with the highest incidence of cSCC, were diagnosed at a median time slightly later than the hepatic group but over 1 year before the renal group. These particular findings can be used to inform referral to and dermatologic follow-up periods. The major limitation of our study was its retrospective nature. Subsequently, we relied on information available in electronic medical records and could not randomize or standardize patients to one immunosuppression regimen. Recording the cumulative dosage, rather than exposure, to immunosuppressive agents could yield more practical information; however, this information is not readily available retrospectively. Information regarding Fitzpatrick skin phototype information and family history of skin cancer was also not available for capture. Finally, with varying degrees of confounding variables affecting each transplant group, it is not feasible to match all cohorts for demographics, such as history of actinic keratoses or exposure to potent immunosuppressive and carcinogenic medications. Nonetheless, our study is one of the largest examining the impact of type of organ transplanted on the incidence of cSCC. The type of organ transplanted is associated with a unique risk of cSCC. Given the increased morbidity and mortality of cSCC in the transplant population, referral for dermatologic surveillance and early excision should be prioritized in cardiothoracic, hepatic, and renal transplant recipients, respectively. Cardiothoracic transplant patients were found to have the highest risk for cSCC, whereas hepatic transplant recipients presented earlier, in one of the largest single center studies investigating posttransplant cSCC. Organ Procurement and Transplantation Network Web site. 2017; http://optn.transplant.hrsa.gov/. Accessed September 9, 2017. Greenberg JN, Zwald FO. Management of skin cancer in solid-organ transplant recipients: a multidisciplinary approach. Dermatol Clin. 2011;29(2):231-241, ix. Moloney FJ, Comber H, O'Lorcain P, O'Kelly P, Conlon PJ, Murphy GM. A population-based study of skin cancer incidence and prevalence in renal transplant recipients. Br J Dermatol. 2006;154(3):498-504. Krynitz B, Olsson H, Lundh Rozell B, Lindelof B, Edgren G, Smedby KE. 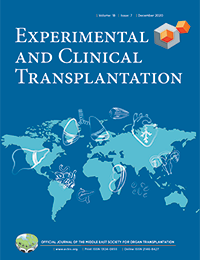 Risk of basal cell carcinoma in Swedish organ transplant recipients: a population-based study. Br J Dermatol. 2016;174(1):95-103. Mittal A, Colegio OR. Skin cancers in organ transplant recipients. Am J Transplant. 2017;17(10):2509-2530. Kelly GE, Meikle W, Sheil AG. Effects of immunosuppressive therapy on the induction of skin tumors by ultraviolet irradiation in hairless mice. Transplantation. 1987;44(3):429-434. Brem R, Li F, Karran P. Reactive oxygen species generated by thiopurine/UVA cause irreparable transcription-blocking DNA lesions. Nucleic Acids Res. 2009;37(6):1951-1961. Zhang X, Jeffs G, Ren X, et al. Novel DNA lesions generated by the interaction between therapeutic thiopurines and UVA light. DNA Repair (Amst). 2007;6(3):344-354. Ren X, Xu YZ, Karran P. Photo-oxidation of 6-thioguanine by UVA: the formation of addition products with low molecular weight thiol compounds. Photochem Photobiol. 2010;86(5):1038-1045. Vincenti F, Charpentier B, Vanrenterghem Y, et al. A phase III study of belatacept-based immunosuppression regimens versus cyclosporine in renal transplant recipients (BENEFIT study). Am J Transplant. 2010;10(3):535-546. Chockalingam R, Downing C, Tyring SK. Cutaneous squamous cell carcinomas in organ transplant recipients. J Clin Med. 2015;4(6):1229-1239. Salgo R, Gossmann J, Schofer H, et al. Switch to a sirolimus-based immunosuppression in long-term renal transplant recipients: reduced rate of (pre-)malignancies and nonmelanoma skin cancer in a prospective, randomized, assessor-blinded, controlled clinical trial. Am J Transplant. 2010;10(6):1385-1393. Norman KG, Canter JA, Shi M, Milne GL, Morrow JD, Sligh JE. Cyclosporine A suppresses keratinocyte cell death through MPTP inhibition in a model for skin cancer in organ transplant recipients. Mitochondrion. 2010;10(2):94-101. Rangwala S, Tsai KY. Roles of the immune system in skin cancer. Br J Dermatol. 2011;165(5):953-965. Mansh M, Binstock M, Williams K, et al. Voriconazole exposure and risk of cutaneous squamous cell carcinoma, aspergillus colonization, invasive aspergillosis and death in lung transplant recipients. Am J Transplant. 2016;16(1):262-270. Williams K, Mansh M, Chin-Hong P, Singer J, Arron ST. Voriconazole-associated cutaneous malignancy: a literature review on photocarcinogenesis in organ transplant recipients. Clin Infect Dis. 2014;58(7):997-1002. Bouwes Bavinck JN, Euvrard S, Naldi L, et al. Keratotic skin lesions and other risk factors are associated with skin cancer in organ-transplant recipients: a case-control study in The Netherlands, United Kingdom, Germany, France, and Italy. J Invest Dermatol. 2007;127(7):1647-1656. Webb MC, Compton F, Andrews PA, Koffman CG. Skin tumours posttransplantation: a retrospective analysis of 28 years' experience at a single centre. Transplant Proc. 1997;29(1-2):828-830. Liddington M, Richardson AJ, Higgins RM, et al. Skin cancer in renal transplant recipients. Br J Surg. 1989;76(10):1002-1005. Jensen P, Hansen S, Moller B, et al. Skin cancer in kidney and heart transplant recipients and different long-term immunosuppressive therapy regimens. J Am Acad Dermatol. 1999;40(2 Pt 1):177-186. Wisgerhof HC, van der Boog PJ, de Fijter JW, et al. Increased risk of squamous-cell carcinoma in simultaneous pancreas kidney transplant recipients compared with kidney transplant recipients. J Invest Dermatol. 2009;129(12):2886-2894. Rashtak S, Dierkhising RA, Kremers WK, Peters SG, Cassivi SD, Otley CC. Incidence and risk factors for skin cancer following lung transplantation. J Am Acad Dermatol. 2015;72(1):92-98. Hamandi B, Fegbeutel C, Silveira FP, et al. Voriconazole and squamous cell carcinoma after lung transplantation: A multicenter study. Am J Transplant. 2018;18(1):113-124. Frost CA, Green AC, Williams GM. The prevalence and determinants of solar keratoses at a subtropical latitude (Queensland, Australia). Br J Dermatol. 1998;139(6):1033-1039. Acknowledgements: The authors have no sources of funding for this study and have no conflicts of interest to declare. This work was presented as a Late-Breaking Abstract in the Cutaneous Oncology Session of the 2018 meeting of the American Academy of Dermatology.